Jäger Josef Steinbacher was born on December 21, 1923 at Schildorn, near Eberschwang, in Austria. He was killed in the fighting for Hill 102 at Stalingrad on September 28, 1942, while a member of the 8th Company in the 227th Infantry Regiment of the 100th Jäger Division. 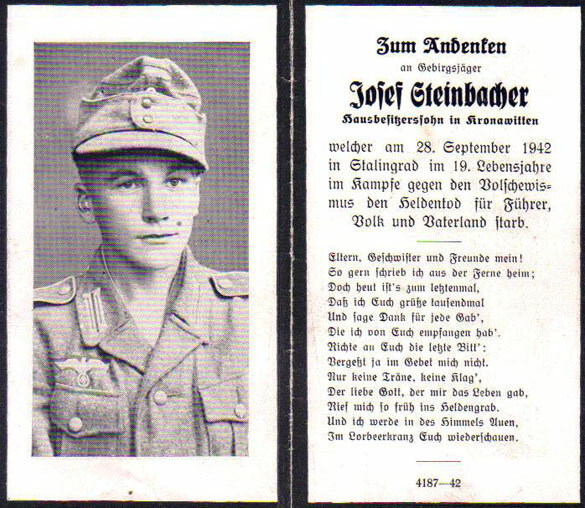 Josef Steinbacher, whose remains were never found for proper burial, is listed in the remembrance book at the German Military Cemetery at Rossoschka. By showing a remembrance card (Sterbebild) for as many days as possible, we hope to show that while for Germany, perhaps 250 soldiers died on a particular day, for this particular family it was a tragedy beyond compare. These cards are one type of German World War II relic that are not outrageous in price.